Hodder & Stoughton, 1999, Hardback in Dust Wrapper. From the cover: “Sixty years ago, Europe lay at Hitler’s feet. Britain faced its darkest hour — outnumbered and friendless as the German army continued its advance. Defeat or capitulation seemed inevitable. But instead a legend was bom. 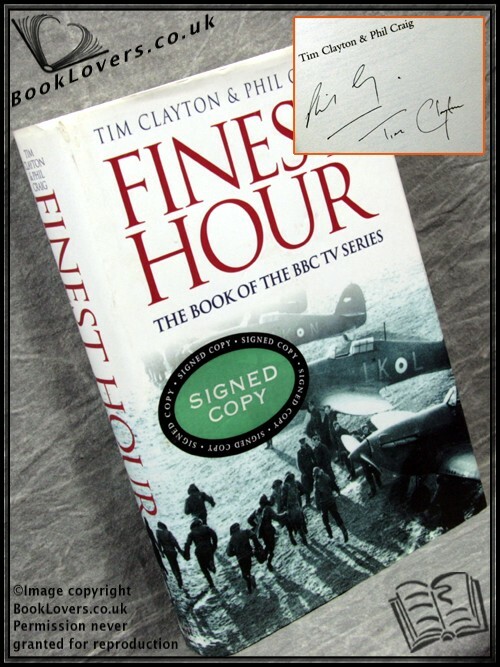 Taking its readers on a breath-taking journey from open lifeboats in Atlantic gales to the cockpits of burning fighter-planes, and through cities devastated by the Blitz, Finest Hour recreates the terror, the tragedy and the triumph of the Battle of Britain. This powerful account of the events of 1940, is told through the voices, diaries, letters and memoirs of the men and women who lived, loved, fought and died during this terrible yet inspiring year. These searing personal testimonies, taken from over a hundred original interviews, are combined with a fresh and often controversial account of the elaborate political intrigues and betrayals of the period — the Royal Navy assault on the French fleet and America’s secret plans to cope with Britain’s defeat. Size: 9½" x 6¼". Black boards with Gilt titling to the Spine. 418 pages.